The decades-long US policy to isolate Cuba lasted half a century has had little effect and will be reviewed, including by re-establishing diplomatic ties and removing the country from the list of states supporting terrorism. This statement came after decision of Cuba authorities to release American citizen Alan Gross, who has been imprisoned for five year. New policy of US President Donald Trump's administration regarding Cuba is regretful, brings back memories of the Cold War era, Russian Foreign Ministry’s Director of the Department of Latin America Alexander Schetinin said Saturday. Secretary of State Rex Tillerson said Washington supports Cuba's economic development as long as it does not help its government. Retired US military leaders called on Donald Trump to continue normalized relations with Cuba. Cuba's state-run company Cuba Export and US-based Coabana Trading LLC have signed an agreement to deliver charcoal to the US - a truly breakthrough deal as it becomes the first Cuban export to the US since President Kennedy's embargo ended trade between the countries in the early 1960's. The senate of Mexico supported on Wednesday lifting the economic blockade against Cuba, President of the Board of the Mexican Senate Pablo Escudero Morales said. 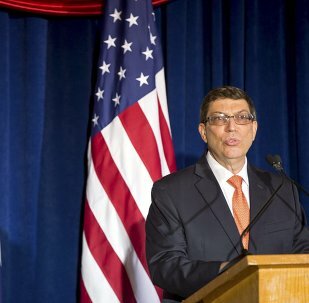 Cuban Foreign Minister Bruno Rodriguez arrived in New York City on Tuesday for the UN General Assembly’s vote the following day on the US blockade of Cuba, the Cuban Embassy in the United States said in a message via Twitter. Washington has lifted restrictions on importing tobacco and alcohol from Cuba. Cuban Deputy Transport Minister Eduardo Rodriguez announced that regular commercial flights between Cuba and the United States will be re-launched on August 31. The United States has put forward for consideration eight air carriers to start scheduled flights to Cuba in the fall, the US Department of Transportation announced in a release on Thursday. The first cruise ship in over 50 years has left Miami, Florida, for Havana, Cuba, local media reported. US President Barack Obama said that an opportunity to meet former Cuban President Fidel Castro and put a symbolic end to Cold War tensions between the United States and Cuba would be welcome. US President Barack Obama, who arrived in Cuba on Sunday, called his visit to the island nation a historic opportunity, according to the press report published by the White House. US President Barack Obama has met with Cuban Cardinal Jaime Ortega on the first day of the historic visit to the island nation. US President Barack Obama, who has arrived Sunday in the Cuban capital of Havana with a historic visit, greeted the island nation with a local expression, which is used by the Cubans while greeting in an informal situation. 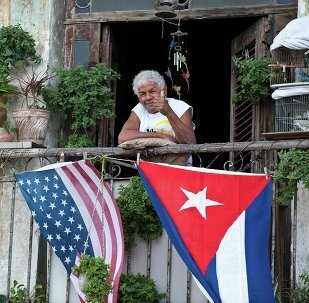 The visit of US President Barack Obama to Cuba is vital to ensure the success of the ongoing process of normalizing relations between Washington and Havana, Jorge Duany, the director of the Florida-based Cuban Research Institute, told Sputnik a day before Obama’s arrival to Havana. 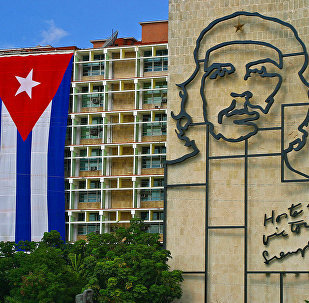 The US hotel company Starwood Hotels & Resorts Worldwide, Inc. signed several deals with Cuba, having become the first US company to operate in the Cuban hotel market in over half a century, the company announced in a release. US President Barack Obama has recorded a skit with well-known Cuban comedian a day before his historic visit to Havana, the press report released by the White House said. 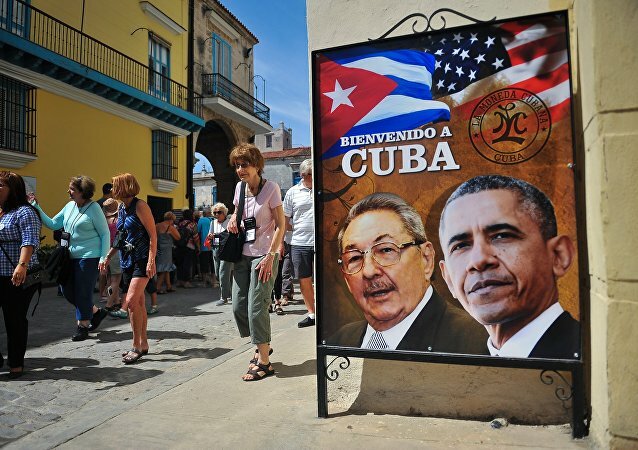 President Barack Obama makes a historic visit to Cuba on Sunday, but he has failed to use the executive powers available to him to substantively ease the burdens of the 55-year US imposed embargo on the island nation, analysts told Sputnik. President Barack Obama’s failure to close the detention center at Guantanamo Bay, Cuba makes it harder for the United States to claim the moral high ground when raising human rights issues with Cuban President Raul Castro, Human Rights First said in a press release. President Barack Obama wants to crown his presidency by ending the US economic embargo on Cuba, but his weakness in Congress means he will fail to do so, former US Agency for International Development (USAID) adviser Paolo von Schirach told Sputnik.